Has the essential Oberheim character/signature, crossed with DSI's sonic DNA - it sounds tight/modern with a nod to vintage Oberheims. Sounds like a modern Oberheim/ DSI cross-breed with plenty of texture from the 2-pole state-variable filter. Good mod facilities onboard. Some panel labelling obscured by dials at some viewing angles. Sequencer transpose only if you hold record while pressing a key. Tom Oberheim has come back into the fold with a sonic boom with the help of old friend/competitor Dave Smith. 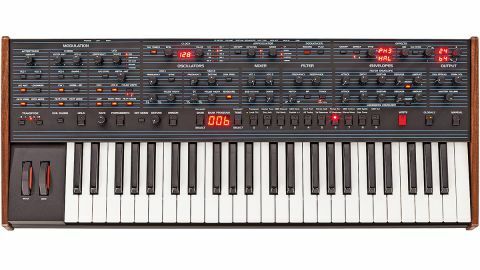 The OB-6 essentially uses the same chassis, effects engine and basic design as the Prophet-6, but Oberheim has popped in SEM-based voice cards, added to his much-loved SEM-based 'state variable' filter (aka Filter 2 on DSI's Pro 2 synth). No doubt this has helped to keep production/R&D costs down without compromising the signal path quality, which is a great thing for audiophiles and cost conscious folks alike - not that the OB-6 is cheap though, at around £2,250 currently. The OB-6 looks great and with its blue-line-adorned front panel and chunky knobs (which all transmit/ receive MIDI CCs) it's throwing back to the design of the classic OB-Xa and OB-8. A similar vintage font is featured, along with familiar black preset selector buttons with red LEDs and the whole thing looks very future/retro, though the striped design is harder on the eyes than the elegant P6's front panel and several functions are labelled above the dials which makes them harder to read at certain angles. Compared to the Prophet-6, things have moved around, so the volume control is now on the right (we prefer it on the left to keep your right hand free for playing), but also the effects have been moved from the left to the right side, which is a more logical place in terms of following the signal flow. The OB-6 shares the dimensions, basic OS/firmware, connectivity, similar walnut end panels, solid- feeling red-backlit performance wheels (pitch and mod) and the general built-like-a-tank feel of the P6. It's weighty, yet still portable. The case/chassis is all metal, the dials feel sturdy, the patch select switches click reassuringly and, although the smaller selector switches have some give, they are solid. One of my favourite features on my P6 (and OB-6) is the 4-octave keybed - it's one of nicest feeling synth-action keybeds and is perfectly balanced for every style of playing. The aftertouch response is spot-on and can be customised, plus there are velocity curves to suit different playing styles (velocity affects the filter and amp independently). We would rather have five octaves, but in most situations four is fine. DSI has used the same clear red LED displays as on the P6 (one for patch/bank/functions and three smaller displays for the FX and arp/ sequencer bpm) but that's thankfully as far as the menus go (except for some global/MIDI functions). Selecting from the varied and well-chosen 500 factory patches (with 500 user spaces) is done via the bank/patch buttons, or you can use the increment/decrement function to step through sounds quickly. There's still no patch naming (though this can be done via the Soundtower editor) so you'll need to remember sounds by number or write a list! Despite this, one of the strongest points of the OB-6 (and the P6) is this no-messing, knob-per-function ethos. The learning curve is very shallow - just plug and play! "It's a different experience to the Prophet-6 - think more wiry, gnarly, fibrous, in your face, textured and buzzier." Function-wise, everything on the P6 is included but there are some noteworthy changes. You have two SEM-based (Synthesizer Expander Module) analogue VCOs, both of which are continuously variable (Osc1 from saw through pulse and Osc2 from triangle through saw to pulse), with Osc 1's shape being modulatable. There's also PWM on both oscs for evolving sounds - film composers will love this machine! The tuning is stable and settles comfortably a couple of minutes after power-up and, though not immediately apparent, Dave Smith's 'slop' control is still included but re-labelled Detune. It works particularly well when detuning six voices in unison mode, while in poly mode it introduces more sonic instability as you increase the level - a little goes a long way to making the OB sound more vibey/vintage. VCO2 can be detuned against VCO1 and this detuning sounds more natural than the P6 as DSI has loosened things up a little. If tuning does go out then there's an autotune routine which is best performed at several different room temperatures initially, so that the OB-6 can best learn/compensate its tuning tables for all sorts of playing situations. So once you have two oscillators detuned what can you do with them?! Firstly, you can sync them together (patch 007 is a great example of a beautiful sync sound, with the LFO slowly controlling VCO2's pitch). Next, VCO2 can be decoupled from the keyboard voltage for drones and can be used in low frequency mode too, as a pseudo second LFO. Then you can move to the mixer section, push levels for more saturation/clipping, add in some white noise (digital) then add the square wave sub-oscillator (more ballsy than the Prophet-6's triangle sub oscillator). The OB-6 is certainly a killer dirty bass machine, though the P6 is equally so, just with a creamier/thicker/slightly more well-behaved character! Next up is the 12dB-per-octave, 2-pole state-variable SEM based filter and this is the key to the distinctive Oberheim tone. It has a precise yet fizzy/gooey character and by design lets more high frequencies through compared to the P6's 24dB low-pass. The filter works well for bright aggressive/driven tones, drums, roughed-up leads, warm yet harmonically present pads, rubbery synth brass and growling unison basses, but works beautifully for softer sounds too, adding character and welcome 'break up' to the highs - add some delay or reverb and voila! As the filter state is continuously variable and modulatable from LPF through Notch to HPF (there's a separate BPF too, modulatable via X-Mod), this allows a whole host of other-worldly textures to be achieved. It's a very bold-sounding synth, although as the OB-6's character is so distinctive, it's less 'chameleon- like' than the P6. Notably, the filter/ resonance doesn't self-oscillate and instead highlights a chosen area of your sound - as you add more resonance it thickens and drives the sound in a pleasing, almost vocal way that picks out the harmonics beautifully. It's a completely different experience to the P6 - think more wiry, gnarly, fibrous, in your face, textured and buzzier. There's also a fair complement of modulation. The audio-rate-capable, 5-mode LFO syncs to MIDI and can modulate VCO1, VCO2, the pulse width of one or both oscs, the amp, filter frequency and the filter mode, so it's pretty powerful. Then there's the polyphonic modulation section of the P6, on the OB-6 called X-Mod. Unlike the LFO which applies to all voices globally, X-Mod allows modulation per-voice for more complex/detailed sounds and here you can use the filter envelope or VCO2 to polyphonically modulate VCO1, VCO1's shape/PW, filter freq, filter mode and to vary from LPF/ Notch/HPF (normal) through to BPF mode - a hugely versatile section. Subtle or more wayward modulated textures can easily be achieved using this section and happy sonic accidents are its forte! Finally, the filter and amp envelopes (both have bi-polar amount controls) are snappy and very detailed, enabling extremely punchy basses and cutting sounds to be made with ease. To sum up, the P6 and OB-6, though built in (literally!) the same mould, are very different yet complementary-sounding beasts! One is inspired by the Prophet-5, the other by the OB-Xa/OB-8. The bottom line is they both sound top dollar but ultimately it comes down to whether you prefer creamy, thicker and hi-fi (P6) vs aggressive, raspy and industrial! (OB-6), though there is some crossover too! If you still don't know which to choose, there's only one answer - get both!